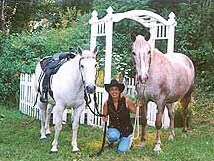 Lori has owned and cared for horses for over 30 years. 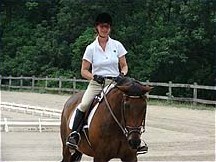 Two of her current horses have been with her for nearly three decades! Sam a registered Appaloosa, has been with her for over 25 years and just recently turned 30 years old. Both have been raised and trained by Lori. Caring for horses is her passion, especially horses in need. In July of 2005, she took in a horse named Apollo that had a severe nail wound to his right hind leg and was nearly euthanized. Apollo is fully recovered and doing great! Loria and Apollo were featured in the Springtime supplement catalog as she used several of their products during his recovery. The storey is currently on their web site www.springtimeinc.com (click on spirulina wafers). Their story is also chronicled in the children's book "Apollo the Horse" and is available at www.kindredspiritshorserescue.com. Rehabilitating Apollo has inspired her to start the horse rescue "Kindred Spirits" dedicating part of her facility to the rescue. 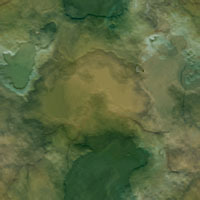 Click on the Kindred Spirits link for more info. All proceeds to the book "Apollo the Horse" go to the rescue. 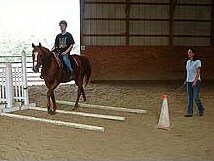 Along with managing and daily care of the operation and horses, Lori works with beginner riders, teaching them basic riding skills and horsemanship, as well as intermediate riders, these skills can be applied to any discipline. She also works with autistic children through a program started by Tri County Human Services, providing mental, emotional and physical therapy while introducing the children to these wonderful animals. Under the guidance and instruction of Elaine Tweedy, Lori is currently showing in Introductory Level Dressage and Adult Beginner Hunter Under Saddle. She is a member of The American Paint Horse Association, American Quarter Horse Association, Northeastern PA Horseman's Association, Pennsylvania Equine Council, American Riding Instructors Association and the American Youth Horse Council. With the opening of Painted Acres in 2002, Lori has realized her dream of owning such a facility and making equines her life's work. In 2007, Lori received a Woman of Merit Award from The University of Scranton Small Business Development Center, as part of their annual Award for Wman Entrepreneur program. Lori's horse Sam turned 30 years old in June. Happy Birthday Sam! Click here to see a picture of Lori and Sam.